Twice a day, a predetermined class will be given a rate up. For 12 hours, when doing free quests in which that class can spawn, most, if not all, enemies will be of the rate-up class. Wait until a rate-up begins to farm coins for chocolate CEs and event shop items, since this is the best time to use CEs to farm for coins, and all coins can be converted 1:1 to Baking Chocolate. Note that not all classes get the same number of rate up periods! There were 16 rate up periods (JP); Saber gets the most at 4, and Rider has 3. The other 4 non-Berserker classes each get 2, while Berserker-class only gets a single rate-up period! So make sure you farm all the Berserker coins you need when that period is active! Also, if you miss Archer/Lancer/Caster/Assassin, be aware that each of those classes will only get 1 additional rate-up, and that both Archer rate-ups are on the same half of the day. Event Craft Essences will increase the number of Choco Coins dropped based on the equipping Servant's class (summoned from the banner) or the specific Craft Essence being equipped (Valentine's chocolate). Purchase Melty Sweetheart from the Event Shop; this CE boosts Choco Coins of all classes by +2. The first costs 400 and is a recommended purchase. The second costs 600 . More are available but they are fairly expensive and not recommended. If you have rolled in the Event Summoning Campaign, equip Street Choco-Maid, Kitchen ☆ Patissiere, and Valentine Dojo of Tears to boost Choco Coins of the class of the equipped Servant by +5, +2, and +1 respectively. These Valentine's Chocolate CEs are only available for purchase if you possess the Chocolate-giving Servant. If looking for maximum gains from the Event, it is recommended to only buy the number you need in a party. For example, if six Valentine's Chocolate CEs are available for a particular class, you will not be able to use all of them in your party if you bought all of them. Look at whether you have Street Choco-Maid and Kitchen ☆ Patissiere, and how many Melty Sweethearts you have or will be purchasing from the shop, and buy enough to fill any gaps in your party. If you just want to collect the scene, though, you should purchase all the Chocolate that features Servants you like. While it may be tempting to equip the chocolate given by a particular Servant to that Servant in Support, this is not advised. CEs given by your female Servants boost drops of that class, which means you would be fighting targets of the same class to get those drops. Instead, equip them onto any Servant of the class that has advantage on your Servant. Each female Servant (as well as Chevalier d'Eon) has a unique Valentine's chocolate Craft Essence that can be purchased from the Event Shop for 150 Choco Coins of that Servant's class. This Craft Essence increases drops of Choco Coins of the class of that Servant. Only chocolates from Servants you have summoned will be available. Each CE costs 150 of that Servant's class coins. The CEs have no stats or effects, but they do increase the Choco Coins dropped for the class from whom you received the CE. Example: Nero Claudius gives Imperial Chocolate, so equipping Imperial Chocolate will increase Choco Coins [Saber] dropped by 2, no matter which Servant equips it. Chaldea Standard (Mash Kyrielight) and St. Orleans (Jeanne d'Arc) increase Choco Coins [All] dropped by 2. Male Servants cannot be summoned from this banner. The limited Servant Nero Claudius (Bride) always has a rate-up, and most days another 5★ female Servant will also have a rate-up. Each female Servant (as well as Chevalier d'Eon) has a unique Valentine's chocolate Craft Essence that can be purchased from the Event Shop with 150 Choco Coins of that Servant's class. These CEs come at level 80, have no stats, and increase the number of Choco Coin drops of the class of the Servant who gave you the chocolate by 2. 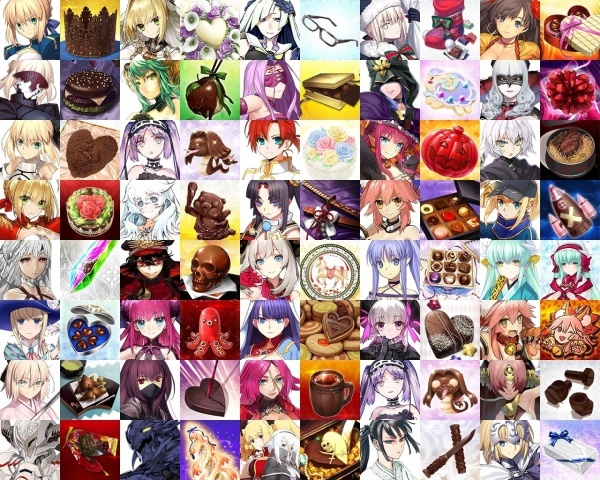 Trading for one of these chocolate CEs will also reward you with a short scene of the Servant giving you the chocolate! These scenes can be viewed again from My Room (under Event Logs), or on the Story page. The Nero Claudius (Bride) Trial Quest is available for the duration of the summoning event from Chaldea Gate. It is an easy quest that only allows Nero Bride as a support Servant in order to showcase her usage, skills, and animations. This page was last modified on 10 February 2019, at 12:11.